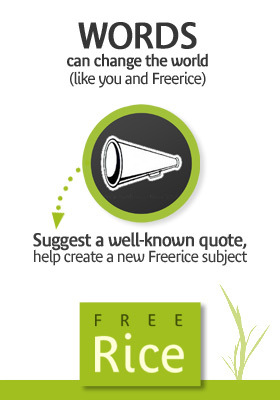 Millions of people have played the award-winning game FreeRice, but now you can help create a new subject category. FreeRice is inviting everyone to submit their favorite quotes to potentially be included in their new “Famous quotes” section. Visit the Free Rice site and suggest a quote. There are some basic guidelines to follow and you can submit as many quotes as you like, ten, twenty or one thousand. What you will be doing is helping to fight world hunger. Every time someone plays FreeRice and gets a correct answer, ten grains of rice are donated to the UN World Food Programmme (WFP), the largest hunger fighting agency. So by creating this new section you will be spreading wisdom but also helping people living in extreme poverty. There are nearly one billion people suffering from hunger worldwide. Visit the Suggest a Quote Page.